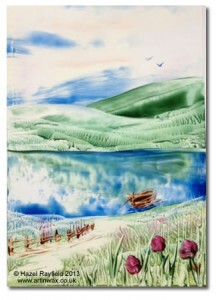 Encaustic Art is a wonderful art form taking in many different types and styles of painting. I am an artist with a passion for painting in hot wax. As you will see from my Art In Wax website and gallery I love to paint flowers and floral subjects. I also paint Landscapes and Seascapes, many of which also have flowers included, I find in my own style of painting a simple landscape makes a great back drop to the detail in the picture. I have been asked recently how I create the landscape background detail, so decided to create a film of me creating a very basic scene to demonstrate how this can done. It is then ready to add as much detail into the foreground as you want. I tried to paint this picture as fast as I could in order to show quickly how this type of landscape could be achieved however it was still a long film in terms of internet time, so in editing I have sped up the filming to triple time. This way you can see the whole picture develop without it taking too much time or getting to boring! However with this in mind, there is no narrative to the project so I have decided to write a brief description of what is happening in the film here as a point of reference should you wish to know more about this demonstration. Sky – Covering the iron with white wax, then doting on some blue and a tiny bit of light pink I create the sky across the top of the card. Mountains – The distance, horizon and mountains are formed in dark green wax. Background – The classic way to create texture in encaustic art is to do a dabbing technique with the iron this lifts the wax and can create details, albeit in a random form. I don’t use the dabbing technique very often in my paintings but it can give a good effect, which can later be worked to form more detail such as trees or shrubs if required. Always remembering to clean the iron between colour changes. Lake – the lake is formed by coating the iron surface in a mid blue wax and covering the mid part of the card, going a small way over some of the green. By allowing some green to show through this gives the feeling of a reflection in the water. Grass – A coat of green and yellow wax this time and again some dabbing, then adding some very dark pink dots to the iron and very softly dabbing these on to give a feel of flowers in the mid distance. Detailing – adding some detail with the stylus, moving some of the wax to create grasses and texture. Boat – using brown wax to add a boat on the lake, gives the painting a focal point and draws the eye into the picture, plus adding a little dark blue shadow, gives the water and the boat movement. Pathway – by rubbing away a little of the wax a pathway is formed. Fence – A fence is added in brown wax, curving around a little to lead down to the water, remembering to add a little shadow on the path. Foreground – more dark green wax is added to make some grass in the foreground. Birds – a couple of birds are added into the sky. Flowers – some pink flowers are added to the front of the picture, bringing the landscape painting to the finish. As with all wax painting I give this a light polish over with a clean tissue and the painting is done! The video below shows all this in action ……. Did you enjoy this blog post? Are you an encaustic painter? Please leave me a comment. Edit : following the comment from Stephanie Guy I have now added this picture of the finished painting. Great video Hazel, I wondered how it was done and good idea to have the description too. Fascinating! I love watching you speed paint! You make it look easy but I’m sure it’s not, you need a very steady hand. Very impressive and a beautiful finished painting. Wow that was really cool! Can you post a photo of the finished painting on the blog too? Great idea Stephie, thank you I have now added a photograph of the finished Landscape into the post. Wow – thanks so much for linking to your videos from folksy forum. I’m in awe. To see you “just” swoop an iron across a page and suddenly I can see a lake with clouds reflected there – amazing. I think one of the true tests of an artist is how they (you) make something so complex look so easy. I am off to browse your shop now. Thank you Heather, glad you liked the videos, they are great fun to make and wonderful to be able show just what can be done in this amazing medium. Painting in wax is my passion, I am sure you can tell.